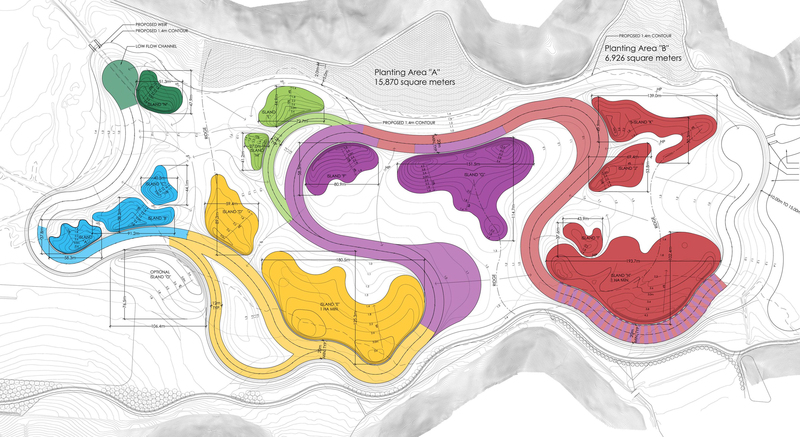 How often does a single design firm get the opportunity to turn a 3,000-acre property into a sprawling work of integrated art, architecture, agriculture, ecological and cultural reclamation, wildlife preservation and landscape design? That’s what Thomas L. Woltz and his design team at Nelson Byrd Woltz has accomplished at Orongo Station in Poverty Bay, New Zealand. 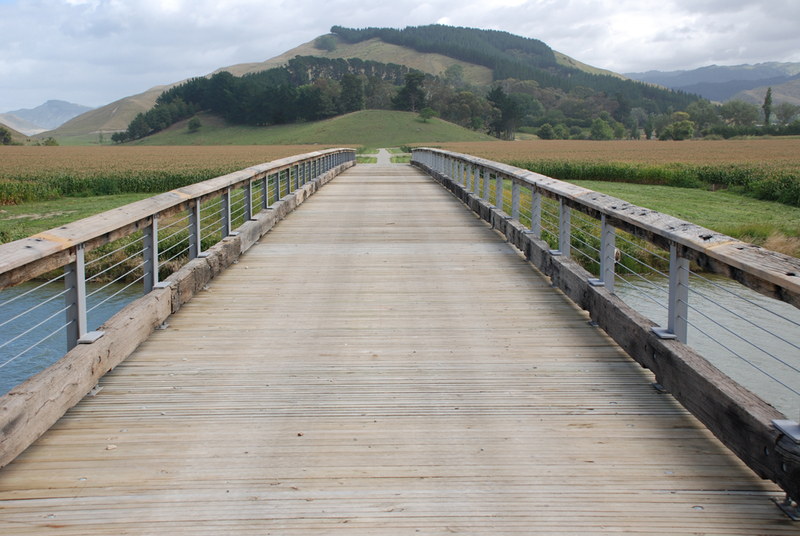 The project includes the restoration of an old homestead that was already on the site, new out buildings and utility buildings, domestic gardens, re-configured wetlands, sheep paddocks, a reforested coastline, a ceremonial bridge and citrus groves, as well as the expansion of a Maori burial ground. It’s almost too much for the imagination to take in. Rather, it grows on you slowly, as does the level of care and integration that went into the property’s evolution. The decade-long project grew in incremental stages, as the client’s program expanded from a relatively small house-and-garden restoration and remodeling to a vast and self-sustaining kingdom by the sea. “The vision grew after a great deal of research we did on the ecology and historic cultures of New Zealand,” said Woltz who is handsomely dressed in vest and tie and speaks with a passion and intensity that seem uncharacteristic for his profession. He makes the work sound more like a mission than another design commission. “‘What is this place?’ we asked. There is no such thing as a blank slate.” Indeed, Orongo was conceived at such a vast scale–it is six times larger than the city-state of Monaco–and with such complexity and natural diversity that it verges on spawning its own Creation mythology. Environmental conservation and sustainability often remain abstract concepts in the human imagination and it becomes the job of a holistic thinker like Woltz to bring all of the parts together into a readable narrative. While his team’s research includes everything from water tables, flood cycles, native plants, wildlife habitat and migratory bird flight to cultural history–and more besides–he still sees himself as a “designer” who takes all the complexities of a site and works them together into a highly integrated expression. “We want to encourage a responsiveness to the environment through artful designs and ecological narratives that connect people to place,” says Woltz. In other words, design with a capital “D” can play an immensely important role in bringing ecological awareness to everyday life, and Woltz emphasizes that his firm’s landscapes are meant to be “composed”, not simply intended to look like natural extensions of the existing topography. Indeed, his comprehensive maps and site plans resemble abstract paintings with swirling forms and colors, and in this project he cites the lyrical work of Ricardo Burle Marx, the great Brazilian landscape designer who was also an accomplished painter. “Modernist design sensibilities and rigorous geometry form a frame for place-making and restoration ecology at small and large landscape scales,” says Woltz. Invasive animals such as rats, stotes, weasels, and Australian possum, had gotten out of control and were eating the eggs of the migratory birds, and driving them away from the property. 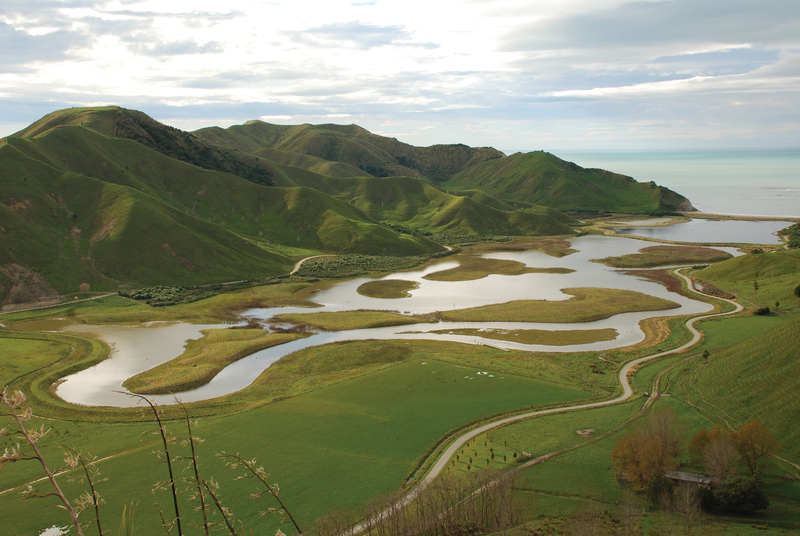 An 87-acre tract on the northern peninsula, called the Tuatara Preserve, was re-forested with 45,000 trees and turned into a predator-proof enclosure, protected with high fencing from cliff-face to cliff-face, stretching across the entire peninsula. Steve Sawyer, a locally-based conservation biologist, made recordings of the endangered birds and created a solar-powered CD player and speaker system that plays their songs twice a day and lures the birds onto the preserve. 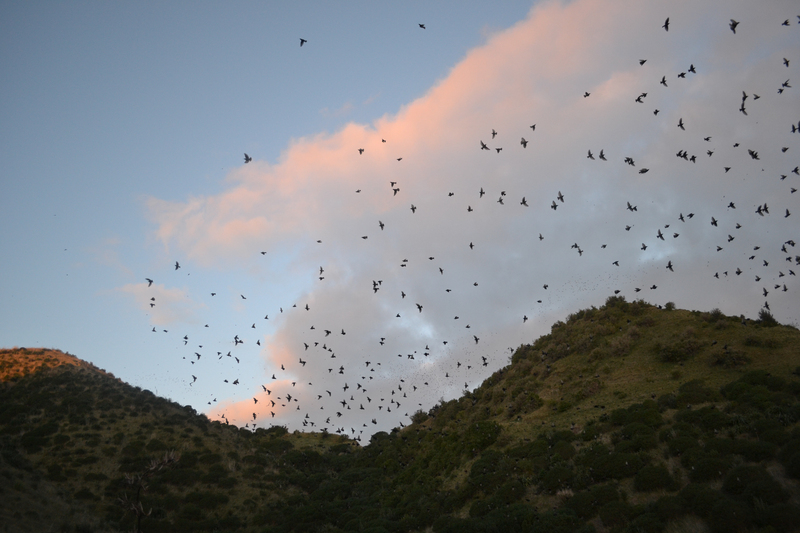 “The birds circle around, attracted by the familiar calls,” explained Woltz. 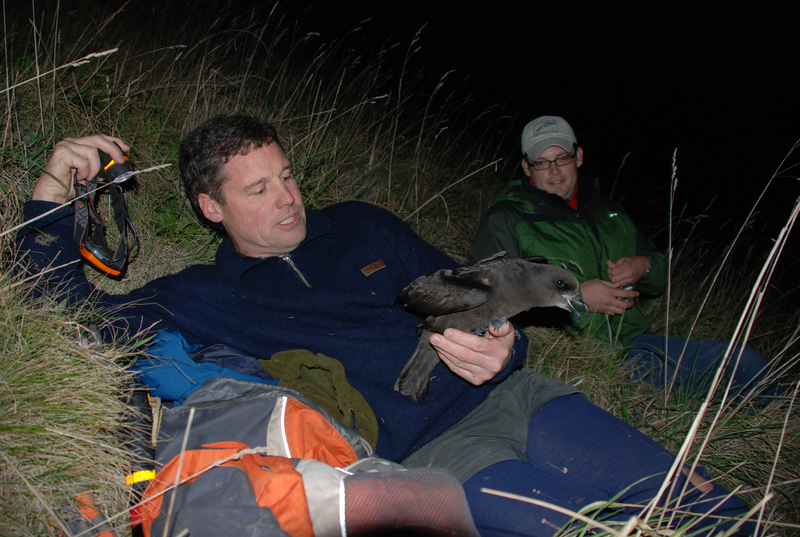 “Now there’s a massive population of sooty petrels, fluttering shearwaters and gannets who fly in to lay their eggs without fear of being attacked.” Existing wetlands ran through a valley near the head of the Tuatara Peninsula. They had been drained by a previous owner and during the wet season, the property turned into a muddy mire that made it an unhealthy place for grazing. “Why not dam it up and excavate a complex wetlands composition,” suggested Woltz who consulted with local conservation biologist Sandy Bull and created a weaving pattern of pathways, polders, islands, ponds and waterways to control the problem of seasonal flooding. 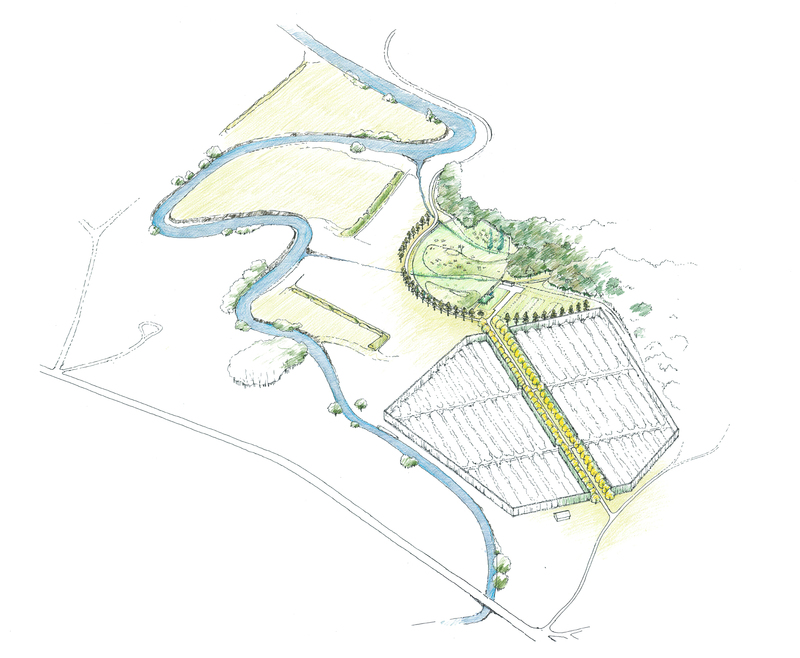 S-curving earthen dams separate fresh-water treatment ponds from salt-water inlets to create greater diversity of habitats for both plant and animal species, as well as creating a bucolic landscape for animal grazing and human pleasure. He began to compose this 75-acre “painting” by riding a motorcycle through the tall grasses, making long and winding curvatures, and leaving the desired track in the grass. “The motorcycle was my drawing tool”. An excavator followed behind and started to shape the paths, dams and islands that took more than a year to build up into their final forms. A system of weirs can be lowered or raised to control the level of water. Narrow polders create separation of salt from fresh water while providing pathways and places for bird watching and the launching of kayaks. 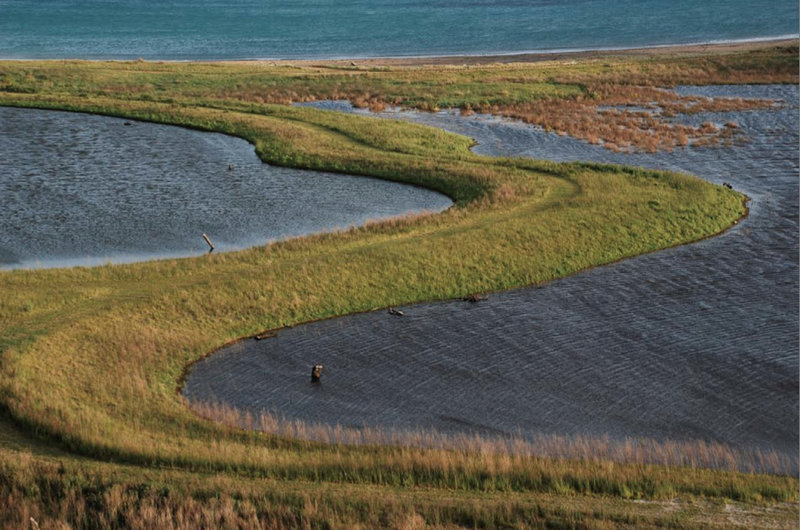 “We were intentionally not designing a natural wetlands,” said Woltz who sees the intervention as a work of art in the service of wildlife, a way to expand the range and diversity of wildlife habitat. The wetlands area is now brimming with oyster catchers, piping plovers, blue penguins, and the nectar-eating Tui, a bird that is native to New Zealand. As one moves south on the property from the outer point and wetlands area through grasslands and rolling hills, one becomes aware of an open but willful organizing principle: a sweeping, spiral-curve geometry has been applied throughout the 3,000-acre property, from the road that runs from the beach to the domestic gardens and the layout of citrus groves. 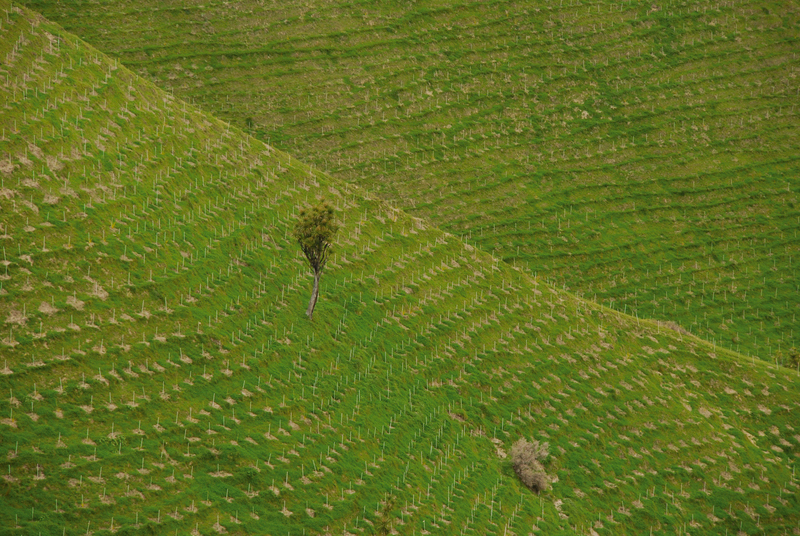 Some of the depleted, overgrazed land has been retired and stabilized with native shrubs and trees such as Ngaio, Taupata, Karo while the working sheep station is efficiently divided into paddocks. The wilder, less-defined expanses of land appear in the periphery of the property, while the landscape becomes more structured and consciously “designed” as one nears the central area where the historic homestead stands. 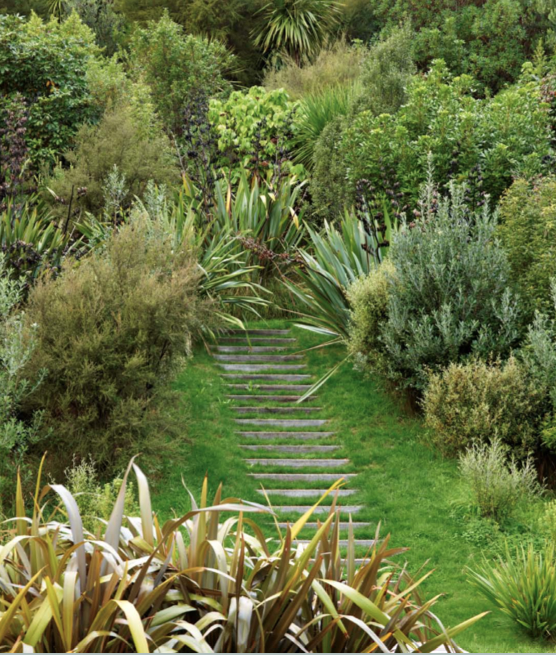 A sequence of different gardens encircle the 19th-century private homestead and are, according to Woltz, a “portrait of the entire property, a microcosm of the greater landscape.” The “Earthworks Garden” has a spiraling bed of low, rounded Hebe, a native New Zealand shrub, and gently sloping mounds that pay homage to the ceremonial earthworks of the Maori people. 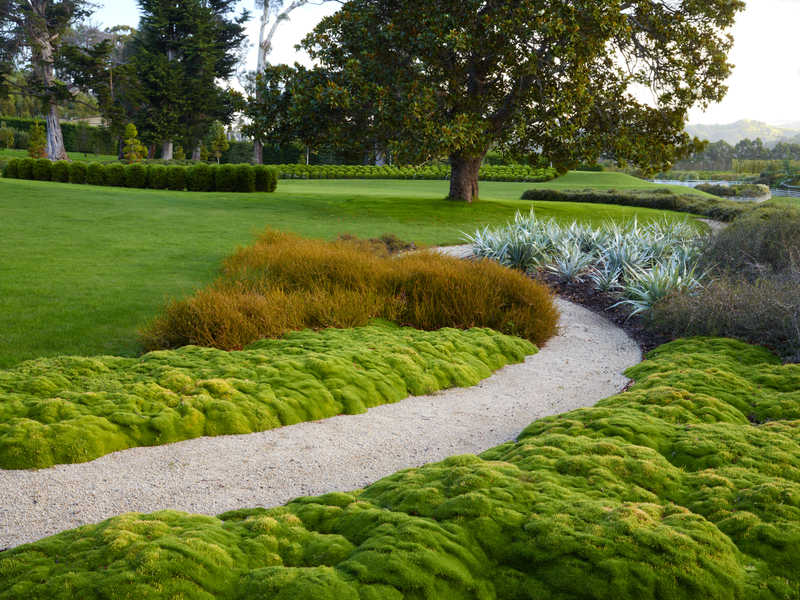 “We had contact with Maori elders about the layout of this garden,” said Woltz. For the “Endeavour Garden”, Breck Gastinger, a Woltz associate, visited the Royal Horticultural Society in London to learn what kinds of plants English botanist Joseph Banks sent back from New Zealand aboard Captain Cook’s ship Endeavour in 1769. “We got that plant list and made a perennial garden from it,” said Woltz. The “Timber Garden” is planted with key species from the New Zealand lumber industry including Rimu, Totara, Kahiicatia and Sequoia that settlers first brought from North America, and the “Homestead Garden” is made up of both native and English plants that early settlers wrote about in their letters back to Great Britain. Right next to the house itself, Woltz added a 100-foot-long pool surrounded by native New Zealand tree ferns that droop down over the water and provide shade. The 183-foot-long Maraetaha Bridge was designed by NBW and built to connect the original Orongo Station property to a neighboring farm that was subsequently purchased by the client. The free-span, steel-truss bridge crosses the curving Maraetaha River and creates a kind of ceremonial entry to the heart of a highly composed landscape of citrus groves that have been laid out in a series of geometric configurations. “We listened to the needs of the citrus farmers–the turning radius of their trucks, for instance–and gave the grove an artful form,” says Woltz. The citrus trees themselves are protected from ocean winds and salt spray by a “shelter belt” of sheared alder trees that have been clipped into 34-foot-high hedges. A long, central allée is lined with native Kowhai trees that bloom with bright yellow flowers in Spring. 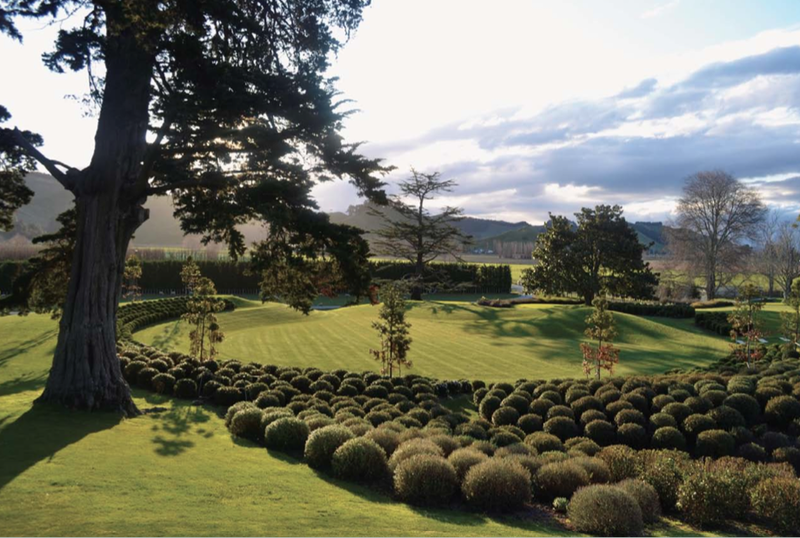 As if that weren’t enough, Woltz also collaborated with Maori elders on an expansion of the 300-year-old Ngai Tamanuhiri (a Maori people) burial ground that lies to the south of the grove. “It was a tremendous honor for our design team to help shape their most hallowed ground,” says Woltz. The bridge, roadway and allée are all oriented in alignment with the burial mound. 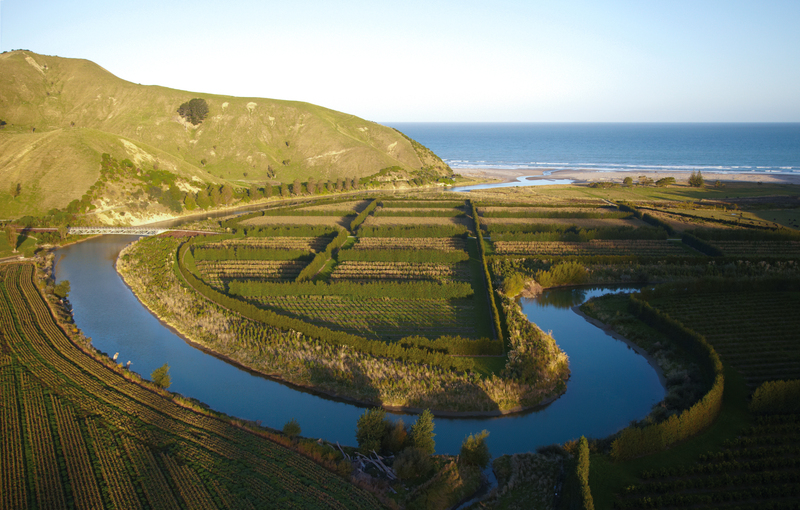 Woltz expresses humility and hesitates to claim full authorship of such an all-encompassing enterprise that includes formal gardens, wetland reclamation, ecological and cultural reclamation programs, as well as an integrated farming system that has become a model for sustainable land management in this part of New Zealand. NBW, led by Woltz, has recently been hired to design a 100-year master plan for Cornwall Park in Auckland. 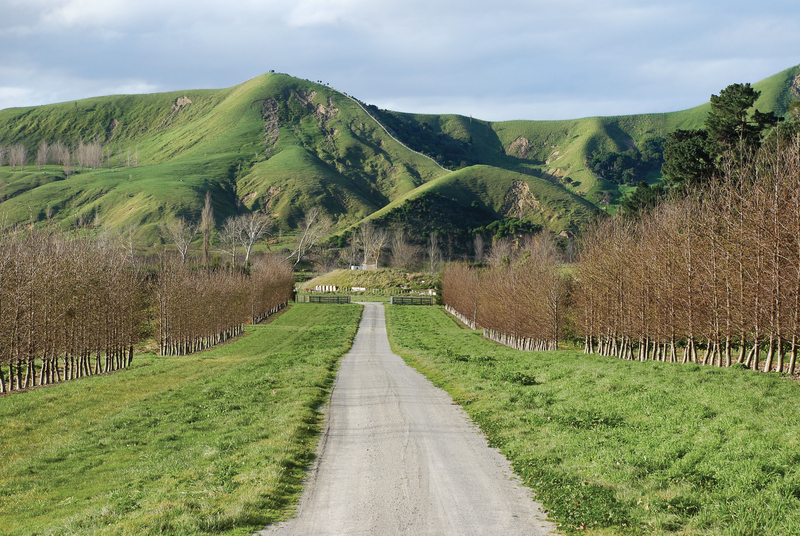 The park includes a large working sheep and cattle farm and stands adjacent to the sacred Maori site One Tree Hill, the largest of Aukland’s nine volcanic cones. “This has all been a colossal collaboration with so many different people–biologists, horticulturists, historians, farmers, wildlife experts, and indigenous peoples,” says Woltz. But he also acknowledges that it takes a single person’s eye, a single overarching vision, to pull all of the disparate parts together and turn them into such a seamless work of environmental art. “The designed landscape can become a powerful tool for telling stories of the land as it helps to promote stewardship long into the future,” he says.